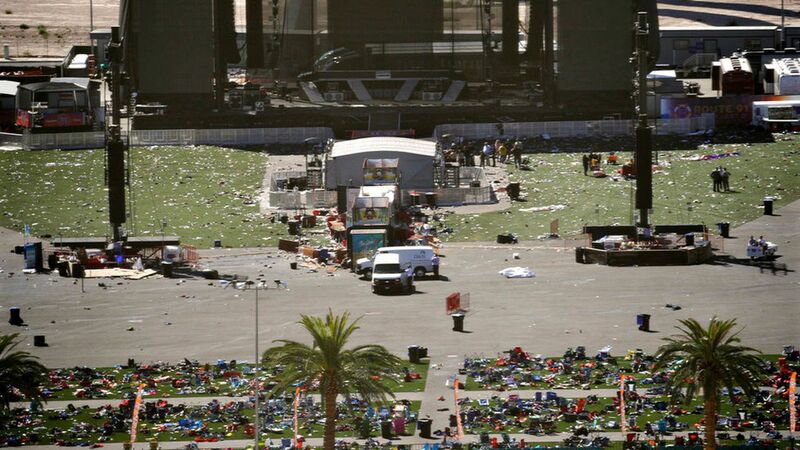 Paddock shot nearly 600 people enjoying the open-air country music concert across Las Vegas Boulevard: 59 killed and 527 injured. "In addition, ... police retrieved 19 firearms, as well as explosives, several thousand rounds of ammunition and 'electronic devices' from Mr. Paddock's home in Mesquite, Nev."
"Las Vegas Valley residents ... rushed to help the wounded; donated blood, supplies and money; and prayed en masse for victims and their families," the Las Vegas Review-Journal reports. Local hospitals had drilled for mass-casualty incidents, and heroically handled this the hundreds of incoming. Civilians took truckloads of strangers to local trauma units, and moved injured in wheelbarrows and on luggage carts, per the Review-Journal. N.Y. Times Quote of the Day ... Shami Espinoza, a concertgoer from California who was caught in the gunfire at a Las Vegas music festival: "Either run and get shot and die, or stay and get shot and die." 5. Who could do this? Why this matters: These bills — while only the first step in a long process — mark the first serious congressional engagement on criminal justice reform for more than a year. Reformers lost all their momentum during brutal 2016 political season, in which candidate Trump elevated "tough on crime" politics at the expense of bipartisan efforts to reduce prison sentences for non-violent criminals. "About a quarter of Puerto Rico will regain power by next month," Puerto Rico's governor, Ricardo Rosselló, told a news conference yesterday, via NBC News. About 10% of households are expected to have electricity in the next two weeks. "The governor also said ... 47% ... of residents have running water and the number should climb to 60% by the end of the week." Per Defense Department, 37% of residents now have cellular phone service. "Most of the ads appear to focus on divisive social and political messages across the ideological spectrum, touching on topics from LGBT matters to race issues to immigration to gun rights. A number of them appear to encourage people to follow Pages on these issues." "44% of total ad impressions (number of times ads were displayed) were before the US election on November 8, 2016; 56% were after the election." N.Y. Times: "Facebook ... turned over more than 3,000 of the Russia-linked advertisements from its site over to the Senate and House intelligence committees, as well as the Senate Judiciary Committee." WashPost: "One of the Russian-bought advertisements ... featured photographs of an armed black woman 'dry firing' a rifle — pulling the trigger of the weapon without a bullet in the chamber." Go deeper ... "Facebook announces ad updates in response to Russia probe," by Axios David McCabe and Sara Fischer. Don't skimp on sleep. Asleep by 1 a.m.., Musk sleeps a healthy 6 to 6.5 hours a night, or he feels grumpy. Get inspired in the shower. Hyper-efficient meetings. In the middle of one meeting, Elon said to a quiet attendee: "You haven't said anything. Why are you in here?" Schedule everything, even if it's in 5-minute slots. Business bonus ... WashPost's Tom Heath: "Laurene Powell Jobs, a billionaire philanthropist, entrepreneur and president of the Emerson Collective [and investor in Axios], is buying a significant stake in Monumental Sports & Entertainment, a sprawling $2.5 billion complex that includes the NBA Wizards, NHL Capitals and Capital One Arena."